Once again South Africans are offered another opportunity to support one of the best education youth led revolution, Walk a Child to School campaign. The school shoes donation intervention is led by two Stellenbosch based social change drivers, Abulele Adams and Wisaal Osman. The noble initiative was inspired by Adams mother who is also a teacher. The compassionate teacher shared a girl in her class who walked with broken shoes to school throughout winter. That painful story propelled Adams and Osman to start on the 5th of October Walk a Child to School campaign. Walk a Child to School aim is to provide school shoes to children in need. The initiative receives donations from people who wish to make a difference in their communities. Teachers identify the children at their school who need shoes. Walk a Child to School collects the money, buys the shoes and hands it over to the children. Teachers identify the children at their school who need shoes. The criterion for selecting children is purely social need. There are no academic requirements for any learner to get the shoes. The next planed handover schools are Ntokwe Primary, in North West in January. The February handover is yet to be confirmed but it will be a school in Garankuwa North West province. The March shoes handover will in Masiphumelele in the Western Cape. In April the two social change drivers will be handing over shoes in Goedgedacht School in the Western Cape. The fifth shoes handover will be at school in Brandvlei in Northern Cape. Approximately 9 400 South African Randelas were donated since the the beggining of the project. The first handover took place at Masakhane Primary School in Port Elizabeth, Abulele’s home town, on Friday 23 October. Abulele’s mom is a Grade 1 teacher at the school. 64 pairs of school shoes were given to 64 very happy children! From 24 October until 12 November, 2 266 South African Randelas and three pairs of school shoes were donated. The handover took place at Masakhane Primary School in PE on Monday 16 November. 20 pairs of school shoes were given to 20 very happy children! From 14 November until 26 November 2015, 3 395 South African Randelas and eight pairs of school shoes were donated! The handover took place at Parkhurst Primary School in Westridge, Mitchells Plain, Wisaal Osman’s Alma Mater Primary School, on Friday 27 November. 32 pairs of school shoes were given to 32 very happy children! 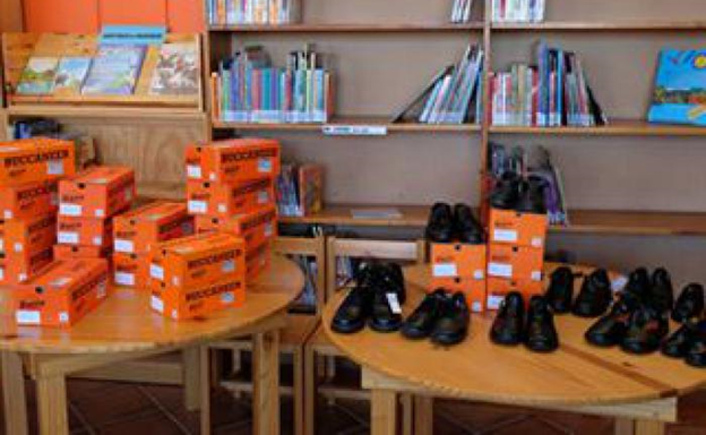 From 28 November until 3 December 2015, 4 710 South African Randelas and two pairs of school shoes were donated! The handover took place at Rietenbosch Primary School in Cloetesville, Stellenbosch, on Friday 4 December. 28 pairs of school shoes were given to 28 very happy children! The two social change drivers have collaborated with organizations like Sindiswa Nobula of The Taung Child Foundation, Tshegetso Community Projects and Goedgedacht Foundation just to mention the few. Adams and Osman humanitarian remarkable story has been covered by reputable publications like Weekend Post, The Boland Gazette, Eikestad Nuus and The Weekend Post. Durban born, American based early childhood development expert and social change driver, Bonginkosi Hopewell Mkhize praised fellow Activator’s intervention. Mkhize said “I have worked with children over the past seven years. I have seen a lot of kids going to school without shoes. I have noticed huge negative impact on those kids’ academic. It also affects their self-confidence. They have social withdrawal syndromes because of the stereotypical stigmatizing treatment from their peers. Most of them lack motivation and they dropped out from school.